The Messermeister San Moritz Elité knife collection have a completely molded, ergonomic and contemporary handle. The blade, bolster and tang are one-piece, hot-drop, hammer forged from a single billet of the finest German steel alloy. Featuring a unique personalization plate, this series of knives will be a statement piece in any kitchen. San Moritz Elité knives are handcrafted individually by 3rd and 4th generation cutlery artisans in Solingen, Germany. The Messermeister San Moritz Elité 7” Flexible Fillet Knife is similar to our standard fillet knife but has a flexible, narrow blade with a spear point tip. 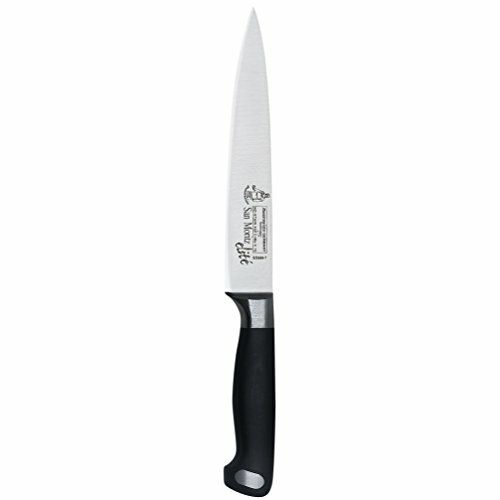 The primary function of this style of knife is used to separate meat from the bone. The flexible version can also be used to separate flesh from the curved surface of melons or filleting fish.